Cognitive Models of Memory provides an illuminating look at various modelling approaches to a whole range of aspects of human memory. 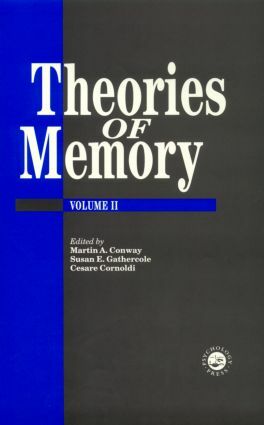 This covers short-term memory through to the representation of conceptual knowledge, the representation of autobiographical memories, neurobiological accounts of human memory, and change in memory related to aging. All the authors deal with the relationship between form (i.e. connectionist and mathematical) models of human memory, with non-formal methods in more traditional verbal statements of theory. The strong theme running through the chapters is the relationship of models to empirical findings, and all the authors consider how models succeed and fail. A superb text for final-year undergraduates and postgraduates, providing the cutting edge in current research. * Comprehensive in scope, examining all types of memory. M.A. Conway, Introduction: Models and Data. S.E. Gathercole, Models of Verbal Short-term Memory. G.D.A. Brown, Formal Models of Memory for Serial Order: A Review. J.A. Hampton, Psychological Representation of Concepts. D.R. Shanks, Representation of Categories and Concepts in Memory. A. Garnham, Representing Information in Mental Models. G.A. Radvansky, R.T. Zacks, The Retrieval of Situation-specific Information. S.J. Anderson, M.A. Conway, Representations of Autobiographical Memories. P.W. Burgess, T. Shallice, The Relationship between Prospective and Retrospective Memory: Neuropsychological Evidence. J. Foster, J. Ainsworth, P. Faratin, J. Shapiro, Implementing a Mathematical Model of Hippocampal Memory Function. T. Perfect, Memory Aging as Frontal Lobe Dysfunction. P.T. Smith, Constraint Satisfaction Models, and Their Relevance to Memory, Aging and Emotion.